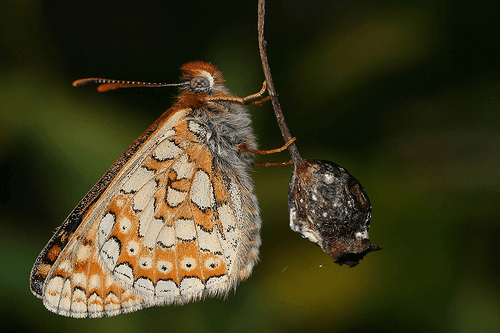 A national survey of the rare marsh fritillary butterfly is currently being commissioned by the National Parks and Wildlife Service (NPWS) and the National Biodiversity Data Centre according to press reports at the end of last week. Butterfly expert and ecologist Dr Eugenie Regan of the National Biodiversity Data Centre described the survey as "the least we can do” for the only legally protected insect in Ireland out of about 12,000. She also pointed out that the marsh fritillary is in danger of becoming extinct across parts of its European range. A recent report released under the EU habitats directive revealed that this endangered butterfly currently faces “unfavourable conservation conditions” in Ireland. According to the NPWS the contract for conducting the survey is currently under tender and will be awarded next month. Work is expected to start immediately, and is expected to end in March 2012. Experts estimate that a total of around 60 survey sites around the country will be included, and a provisional list of 30 sites spanning counties Donegal, Clare, Sligo, Cavan, Leitrim, Limerick, Mayo, Roscommon and Monaghan has already been drawn up. The marsh fritillary favours wet grassy habitats, but its population has come under increasing pressure through land drainage for agriculture.